Dr. Neeraj Kumar is a trusted Cardiologist in Sector-56, Gurgaon. He has been a practicing Cardiologist for 28 years. He has done DM (CARDIOLOGY), MD (MEDICINE), MBBS . He is currently associated with Max Hospital, Gurgaon in Sector-56, Gurgaon. You can book an instant appointment online with Dr. Neeraj Kumar on Lybrate.com. 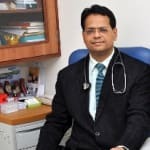 Lybrate.com has a number of highly qualified Cardiologists in India. You will find Cardiologists with more than 32 years of experience on Lybrate.com. Find the best Cardiologists online in Gurgaon. View the profile of medical specialists and their reviews from other patients to make an informed decision. Menopause brings about a lot of changes in a woman's body. It not only signifies the end of her fertility and child bearing days, but it is a sign of growing age and the body progressing in a new direction of aches, pains and vulnerability. While some of these are natural, others can prove to be dangerous as it significantly increases the risk of heart disease (unlike common myths, women do get heart attacks). The risk factor is also goes up if the woman suffers from diabetes, obesity and high blood pressure. One of the widely known, but well ignored fact remains that women with a sedentary lifestyle increase their risk and vulnerability to all of these diseases. A family history in heart disease can also turn into a risk factor when menopause sets in. The natural age of menopause is considered to be around 50 and when a woman reaches this age, the estrogen levels in her body experience a sharp drop. This hormone is partly responsible in maintaining heart health in women. Other factors that are triggered during menopause include changes in body fat distribution from a gynoid to an android pattern, reduced glucose tolerance, abnormal plasma lipids, increased blood pressure, increased sympathetic tone, endothelial dysfunction and vascular inflammation. Walk / Exercise: This isn't a 5-day week practice. You need to exercise throughout the week in order to maintain heart health. It helps your heart to pump blood through your body and also reduces risks to other diseases like high blood pressure and cholesterol. One key benefit is that it helps keeps the weight off - that should be good reason to walk an extra mile. Choose a healthy diet: Most people mistake a diet to be about not eating the things you really like. A good diet can be made very tasty and can also be portioned in such a way that it leaves less room for craving. As always avoid the junk, deep fries and extra helping of cheese. Hormonal therapy: There has been contradicting evidence on hormonal replacement therapy for estrogen can lower the risk of heart disease. Some women continue to be advised this treatment based on their particular case history, especially for women who undergo surgical menopause (when the uterus and other reproductive organs many have to be removed due to life threatening conditions like cancer). The treatment of heart disease has come a long way and one of the more important and fairly common devices used to correct rhythmic problems of the heart is a pacemaker. A pacemaker is a device which is put inside the chest or sometimes even the abdomen to send electrical pulses to the heart to keep it beating at a normal rate. However, the implications in case of heart failure make the usage of the pacemaker much more complicated. In such cases, the device used is a special type of pacemaker which is also called a bi-ventricular pacemaker. This device sends electrical signals to pump the ventricles of the heart so that they can pump at the same time. There are many factors to be aware of before undergoing this treatment. Some of the factors to consider are mentioned below. Requirement for a pacemaker in case of heart failure - When a patient has heart failure, their ventricles or lower chambers of the heart aren't able to pump enough blood into it. This could be due to physical problems with the heart or problems with the electrical system within it which cannot function normally. The doctor will perform multiple tests to determine whether a patient is the right candidate for a pacemaker for heart failure. The procedure - In most cases the device is fitted into the chest and it is done without an open heart surgery. Precautions and post operative care for a minor surgery should be followed. The doctor makes a minor incision on the chest and then inserts the device along with three leads which are connected to the ventricles to ensure they keep pumping properly. Sometimes another device known as the ICD or the implantable cardioverter-defibrillator may be put in to shock the heart back to a normal rhythm in extreme cases where the change of sudden death from high heart rate is a possibility. Immediate post operative care - As mentioned above, the surgery involved in putting a pacemaker is a minor one and the patient is usually discharged in next 2-3 days or may be more depending on the comorbidities & complexity of the scenario. However, in most cases, people can go home the next day fairly easily although some monitoring is done for the next few days with daily reporting. Lifestyle is one of the best defences against heart disease. All you need to do to maintain good heart health is to just make simple but significant changes to your lifestyle. By doing so, you end up minimising the risk factors associated with heart disease such as coronary artery disease. 1. Be physically active - Research by Harvard University shows that watching television for 2 hours a day can increase your chances of developing heart disease by 15%. But if you exercise or indulge in some kind of physical activity for about 30 minutes every day, you can significantly improve the health of your heart as any kind of physical activity improves your blood circulation as well as blood pressure. 2. Maintain a healthy body weight - Having a low body weight or a high one can also put you at risk of getting heart disease. For a good heart health, you need to protect it from fatigue and damage. By keeping your weight at an optimum level, your blood circulation, as well as body fluids, end up working efficiently, protecting your heart from unnecessary strain. 3. Have a balanced diet - Foods that are low in calories but high in fibre and nutrients are what your heart needs to stay healthy. A very common cause of heart disease is the consumption of high cholesterol foods like processed meats, desserts, etc. Including seafood like tuna or salmon, whole grains, fruits and vegetables, and lean proteins such as chicken and fish to your diet can reduce your risk of developing heart disease. 4. Manage stress - Stress is another factor that causes you to have poor heart health. To prevent the damaging effect that stress can have on your heart, exercising is what you should do. This is because when you exercise, you release endorphins (brain chemicals that trigger a feel-good feeling in your body), which help in improving your physical and mental makeup. Additionally, exercising has also been found to reduce your chances of dying from a heart attack. 5. Quit smoking - Research reveals that smoking raises your chance of getting heart disease by about 2-4 times. It causes plaque (fatty deposits) to accumulate and harden in your arteries, making your heart to exert itself harder than normal. By kicking the habit, you reduce the strain that is caused to your lungs, thereby to your heart. How to get rid of blood pressure, because I am now feed up of these tablets every time, please consult me? Not impossible. But depends on bp levels, the underlying problems/comorbidities if any & dedication to life style modifications.